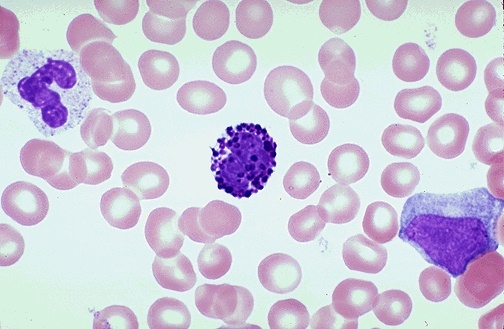 There is a basophil in the center of the field that has a multi-lobed nucleus (like PMN's) and numerous coarse, dark blue granules in the cytoplasm, just like tissue mast cells. Basophils are infrequent in a normal peripheral blood smear, and their significance is uncertain. A band neutrophil is seen on the left, and a large, activated lymphocyte on the right.